Once while Jesus was standing beside the lake of Gennesaret, and the crowd was pressing in on him to hear the word of God, he saw two boats there at the shore of the lake; the fishermen had gone out of them and were washing their nets. He got into one of the boats, the one belonging to Simon, and asked him to put out a little way from the shore. Then he sat down and taught the crowds from the boat. When he had finished speaking, he said to Simon, ‘Put out into the deep water and let down your nets for a catch.’ Simon answered, ‘Master, we have worked all night long but have caught nothing. Yet if you say so, I will let down the nets.’ When they had done this, they caught so many fish that their nets were beginning to break. So they signalled to their partners in the other boat to come and help them. And they came and filled both boats, so that they began to sink. But when Simon Peter saw it, he fell down at Jesus’ knees, saying, ‘Go away from me, Lord, for I am a sinful man!’ For he and all who were with him were amazed at the catch of fish that they had taken; and so also were James and John, sons of Zebedee, who were partners with Simon. Then Jesus said to Simon, ‘Do not be afraid; from now on you will be catching people.’ When they had brought their boats to shore, they left everything and followed him. 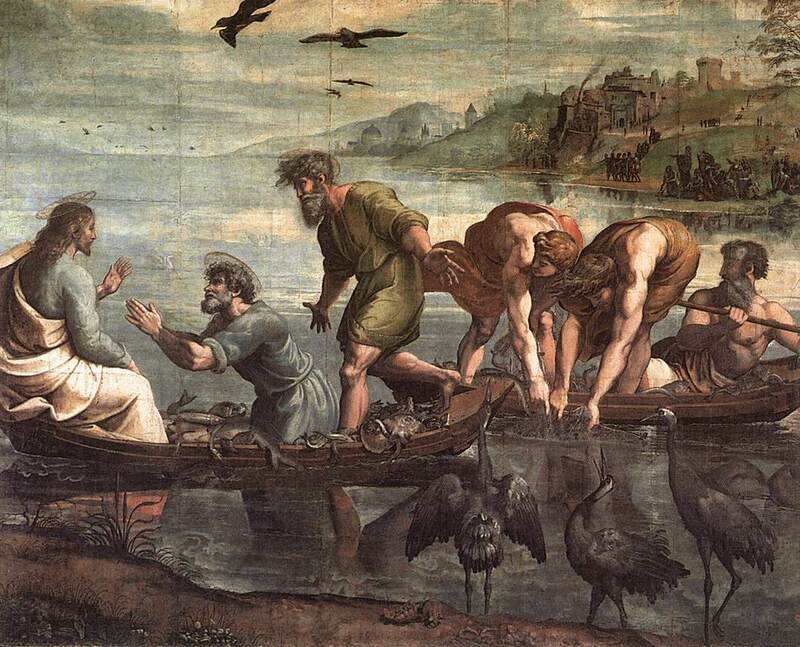 The painter Raphael captures something of the awe of St Peter when he saw how much fish he and his companions had caught, despite their misgivings as experienced fishermen in following the advice of someone they knew to be a carpenter from the mountains of Galilee. St Peter, who had a long way to go in his formation as a follower of Jesus, recognised the utter generosity of God's providence. Columban Fr John Griffin, a New Zealander who worked for many years both in the Philippines and Chile tells a story about St Alberto Hurtado SJ (1901 - 1952) - still known and loved in Chile as 'Padre Hurtado' - and his trust in God's providence in A priest, I bless you - Alberto. Providence was always on his side. At a meeting one night his board of directors was unwilling, for lack of funds, to approve a new project. In the midst of discussions there was an unexpected call for Fr Hurtado to attend to someone at his front door. He had a brief conversation with the caller who said she wanted to leave a gift to help the great work he was doing. He gratefully put her envelope in his pocket, wished her a good evening and returned to his meeting. He looked at the contents of the envelope as he sat down. Then he tossed a check onto the table saying, ‘There you are, ye of little faith!’ It was for one million pesos – worth about US$30,000 at that time. God's providence is something I have experienced many times. One example is when I was asked to write an article for the Columban magazine in the USA, Columban Mission. So I wrote The MiracleGirls! and it was published in October 2012 (pages 17-19) and later in The Far East, the Columban magazine in Australia and New Zealand. 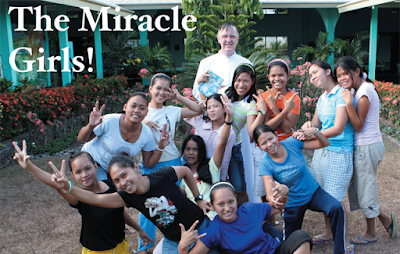 I got the title from one of the girls at Holy Family Home for Girls, Bacolod City,after the release of kidnapped Columban Fr Michael Sinnott in the Philippines in 2009. I had asked the girls to pray for Fr Sinnott's safe release. When I told them that God had heard their fervent prayers - and fervent they were - one of them came up to me and said, 'Father, we are the miracle girls!' (They were actually part of an international 'prayer brigade'). 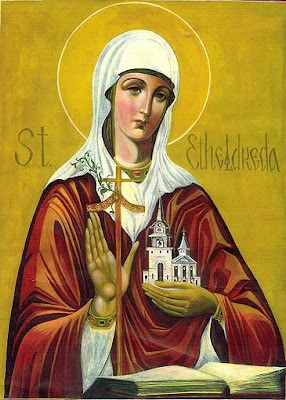 She was expressing something like St Alberto, a total trust in God's providence. I was happy when my article was published but had no idea how many readers would respond with generosity, a generosity that enables the Capuchin Tertiary Sisters of the Holy Family to continue to take care of the girls whom God sends their way just as God continues, more than 60 years after his death, to provide for the Hogar deCristo (Home of Christ) movement that San Alberto started and that has spread to other countries. Like many of 'The Miracle Girls' Father Alberto came from a background of poverty and of violence. But that didn't stop him from hearing God's call. He wanted to be a lawyer in order to help the poor. 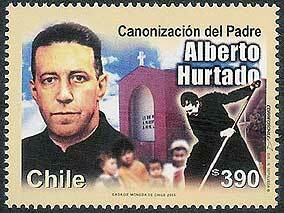 God answered his desire to help the poor of Chile, not as a lawyer but as a Jesuit priest. God called Peter and his companions to let go of their fears and of their work: Do not be afraid; from now on you will be catching people. St Luke tells us directly and simply how Peter and Andrew, James and John, responded to the words of Jesus: When they had brought their boats to shore, they left everything and followed him. They didn't become saints overnight. They failed Jesus many times and Peter even betrayed him. But Jesus never abandoned them and their hope and trust in him never vanished. St Peter's words can encourage us when we can't see things clearly, when we are disheartened, when we've nowhere to turn to: Yet if you say so . . .
Columban Fr Chris Saenz in Chile threw a chronic alcoholic named Ronnie out of his church twice because he was disrupting Mass. In Interview with Ronnie he allows this man to tell the story of the extraordinary change in his life and the part Padre Hurtado played in that. And Ronnie experienced God's providence in being able to attend the canonization of this remarkable saint in 2005: There was a national lottery for Hogar de Cristo to send 36 persons from around the country. There were seven spots for volunteers/workers of Hogar de Cristo and 29 for those who, like me, received aid. Different names were submitted from around the country, including mine and a few others from the Ninth Region. When the first ticket was drawn at the lottery my name was on it. I knew than it was Padre Hurtado’s hand again. 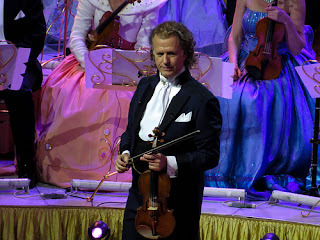 In fact, I was the only one from our Region to go. your footprints mark a new path. who showed a better way. incendiando las calles de una oscura ciudad. y otros más comprendían que era el paso de Dios. y ya siento que enciende ese fuego de Dios. una historia que hizo de este Chile un hogar. lighting up the streets of a dark city. and others who understood that that was the way of God. and I feel that I am lit by the fire of God. su cuerpo castigado en la cruz. his body punished on the cross. tus manos fueron pan y un hogar. your hands were bread and a home. se alsa inmensa hasta el cielo en las manos de todos. that that was the way of God. is infinitely raised to heaven in the hands of all.